KFC introduced a new 'Snacker' sandwich this month along with another 'hidden message' TV ad. 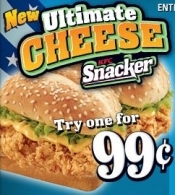 The new sandwich is the KFC Ultimate Cheese Snacker. It "features KFC's signature, 100 percent chicken breast strip, covered in a blend of cheddar and Swiss cheeses, topped with crisp lettuce and served on a warm sesame seed bun." The Cheese Snacker has 280 calories, 11 g fat, 2.5 g saturated fat, 2 g trans fat, 25 mg cholesterol, 290 mg sodium, 32 g carbs, 1 g fiber, 5 g sugars, and 15 g protein. There's that trans fat again. Get with the program KFC and eliminate that trans fat (like Wendy's did). If you don't feel like taping TV ads just so you can watch them in slow-motion frame by frame to find a hidden message, I'll just tell you what it is: "traffic jam". That's what you'll need to enter on KFC's Cheese Snacker page before October 7 in order to enter the sweepstakes and possibly get a coupon in the mail. There's no guarantee you'll get a coupon. Here's the message you get after you enter your name, mailing address, e-mail address and date of birth: "If you are among the 1,000 eligible participants a day, you will receive a $1 gift check (via US Mail) worth $1.00 redeemable toward the purchase of products at participating KFC restaurants"